The history books pick and choose "who invented it" based on who won a specific patent battle. When asked who invented the telephone the name Alexander Graham Bell is often offered as the correct answer. Alexander Graham Bell patented his telephone first, the U.S. Patent Office awarded Alexander Bell, United States Patent No. 174,465 in 1876. An argument could be made for the answer to who invented the telephone could be Alexander Graham Bell, Elisha Gray, or Antonio Meucci. In the 1870s all three of these individuals worked on the technology to transmit speech electrically that would become our telephone system. In the "who invented it" mythology everyone is looking for that one "eureka" moment when something appears out of thin air, a totally new idea. In the real world of technology, inventions are part of an evolution of ideas. The telephone was an extension of the work done by Samuel Morse in developing the telegraph in the 1830s. Samuel Morse independently developed and patented a recording electric telegraph in 1837. The first telegram in the United States was sent by Morse January 1838, across two miles of wire at near Morristown, New Jersey. History books tell us Samuel Morse invented the telegraph based on a 1837 patent, but another inventor, Dr. David Alter, invented his own version of the telegraph in 1836. 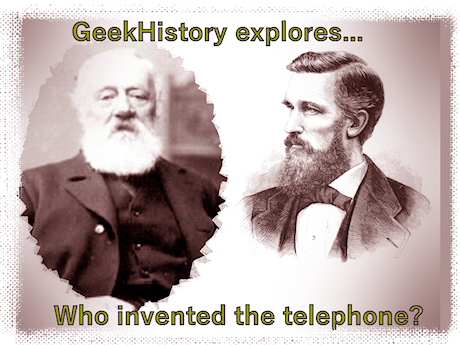 Read more about Who invented the Telephone? 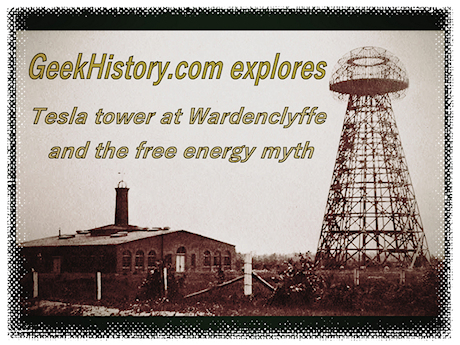 As we dig deeper in researching topics here at GeekHistory the one topic that people keep asking questions about is Nikola Tesla's tower at Wardenclyffe and his free energy theories. We have addressed many of the commonly asked questions in this article. Nikola Tesla sold his Wardenclyffe tower idea to J.P. Morgan based on a plan to send wireless messages to Europe and compete with Marconi. The contract was agreed upon in February of 1901 and signed in March for Morgan to give Tesla $150,000 to build a tower to transmit radio. Tesla began to build his Wardenclyffe laboratory on Long Island, New York in 1901. Soon after construction began it became apparent that Tesla was going to run out of money before it was finished. Tesla underestimated the cost of building the tower, and economic conditions were causing prices to rise for the materials Tesla needed. Tesla's personal goal was to use the tower for the transmission of power as well as information. Morgan was expecting to make money on radio. The wireless power angle was Tesla’s idea, it was never part of Morgan’s plans. It was never finished because Tesla ran out of money. Various sources place the abandonment of the project at around 1904. Tesla took out a mortgage on Wardenclyffe with George C. Boldt of the Waldorf-Astoria Hotel to cover his living expenses. Boldt eventually foreclosed on the Wardenclyffe property and the tower was torn down and sold for scrap in 1917. Adding to the Tesla mythology and conspiracy theories was the timing of the demolition of the tower, during WWI. Various stories were told that the tower was demolished on orders of the United States Government because German spies were using it as a radio transmitter or observation post. Did J.P. Morgan withdraw backing? There are many conspiracy theories that blame J.P. Morgan for Tesla's failure at Wardenclyffe, stating that J.P. Morgan withdrew support because he saw no way to make money on wireless power. The myths and legends run rampant in the stories of both Steve Jobs and Thomas Edison. They have become legendary, and along with that the mythology gets bigger. 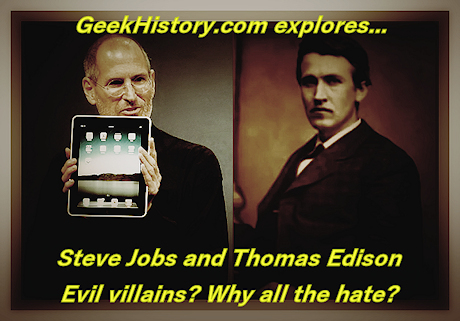 Steve Jobs and Thomas Edison have become the geeks that the world loves to hate. But why all the hate? A common theme among so called successful people is an obsessive compulsion to succeed. Both were known for being hard driving over bearing bosses, which means they made some enemies and acquired some haters along the road to success. Some people say the success of people like Jobs and Edison came at the expense of their former associates. As much as you want to blame Steve Jobs for the departure of Stephen Gary "Steve" Wozniak, aka Woz, from Apple, Woz has said in many interviews that he enjoyed the technology side of creating Apple but not the business side. He left because he felt the need to move on. Even though Woz quit working for Apple in 1985, he stayed on the Apple payroll and remained a stock holder for many years. I would say he has done pretty well for himself as Woz has been involved in numerous technology companies over the years since leaving Apple.